What this photo department employee did with a couple's pregnancy announcement was really not cool. Has anything like this happened to you? Keeping a pregnancy under wraps is tough. Between coming up with an excuse every time you're offered a drink to hiding a growing bump under loose clothes, there are so many things first trimester ladies have to consider. Your doctor's warnings probably aren't the only reason you might be hiding your pregnancy in the short term either—maybe you want to surprise your friends and family members with the news in a fun, memorable way. And while it's only natural that a few people might suspect, no pregnant woman should be denied the privilege of surprising her nearest and dearest on her own terms. Unfortunately, Jordan Areaux didn't get that chance. 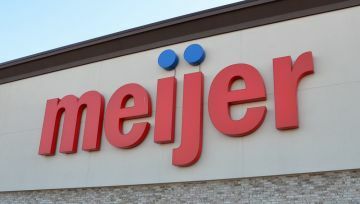 The Michigan woman headed to the grocery store chain Meijer to have pregnancy announcement cards printed, according to reports from The Associated Press. She was excited to break the news to her family, especially since this would be the first grandchild for her parents. But Meijer employees hijacked her pregnancy announcement in the worst way. Areaux reportedly went to high school with some members of the store's photo team, and they began circulating her photos. Eventually they made their way back to Areaux, who was (understandably) "so angry" when she received a screenshot of her own pregnancy announcement. Meijer fired the members who were responsible for this, as the photo department is supposed to adhere to a strict confidentiality agreement. Has anything like this happened to you? Sure, it's reasonable to think a few people in your life might guess you're pregnant before you actually break the news, but this situation is about as unique as it gets.